What are the worst paying jobs out there? While your salary can vary drastically based on your geographic location, experience level, the company you work for, and minimum wage in your city/state, there are a number of occupations that earn consistently low salaries. These jobs are very diverse. They include jobs in industries ranging from entertainment to transportation to health care. However, despite being in different industries, they have a number of similarities. Many of the jobs typically pay by the hour. Many are service jobs that require tipping for the worker to make a decent salary. Others require (or highly recommend) that the applicant have a high school diplomas, and most offer on-the-job training. Here are the top 25 worst paying jobs in America, according to an employment survey from the US Department of Labor in May 2017. Gaming dealers operate table games at casinos, card rooms, and other gaming venues. They may dispense cards or blocks to players, and dispense winnings or collect players' money or chips. Dealers earn an average annual salary of $22,910. These animal caretakers tend to nonfarm animals, including domestic animals like dogs, cats, fish, or, in some cases, zoo animals. They may work in pet stores, animal shelters, kennels, aquariums, zoos, or circuses. Animal caretakers may feed, water, groom, and medicate animals, as well as clean animal quarters. These caretakers earn an average of $25,170 annually. Cooks work in institutions ranging from cafeterias to fast food chains to high-end restaurants. Cooks prepare, season, and cook dishes, and may help plan the menu with the head chef. Overall, cooks earn an annual average of $25,040. On the low end are cooks working in fast food restaurants who earned an average of $21,610. However, private household cooks can earn as much as $50,000 a year, or more. Hotel, motel, and resort desk clerks serve patrons by registering and assigning rooms to guests. Clerks perform a number of transactions, such as computing patrons' bills, balancing accounts, and collecting payments. Clerks also accommodate patrons by addressing any questions and concerns regarding their stay. On average, desk clerks earn $24,250 annually. While some agricultural workers can earn more money in different positions (e.g., agricultural inspectors), farmworkers earn an average yearly salary of $25,070. On the low end are the workers who are typically responsible for manually planting, cultivating, and harvesting plants and/or field crops. Other positions include graders and sorters of agricultural products (those who sort and identify food and other agricultural products by size, weight, color, and condition, and earn only slightly more than farmworkers). These agricultural workers are often responsible for distinguishing between inferior or defective products and acceptable products. Home health aides provide routine healthcare to elderly, disabled, or convalescent people at their homes or in a care facility. Aides may change bandages, administer medications, and/or perform personal care duties, such as bathing and dressing patients. Aides monitor each patient's health status and report observations to a supervisor and/or the patient's family. Home health aides typically have a home health aide certification (which involves completing a nurse-supervised training program). Some are even certified nursing assistants (CNAs). While income depends on one's level of certification, home health aides earned an average annual salary of $24,280. Maids and cleaners perform various cleaning duties, such as making beds, dusting and vacuuming, disinfecting counter spaces, and emptying trash and recycling baskets. They may work in private households or establishments, such as hotels or nursing homes. Maids and cleaners earn an average annual salary of $24,630. Bartenders serve drinks in bars, restaurants, wineries, or breweries. While a bartender's salary will vary based on their location and tips, the average annual salary for a bartender is $26,260. Bartender helpers earn even less than bartenders, with an average annual salary of $23,050. Bartender helpers typically do not serve drinks, but they facilitate service by cleaning counters, washing dishware, and stocking and maintaining supplies. Service attendants examine and repair cars, trucks, boats, or other automotive or marine vehicles. Attendants may be responsible for filling vehicles with fuel, lubricating vehicles, changing oil, repairing tires, or repairing and replacing accessories (such as windshield wipers or fan belts). Service attendants may work at gas stations, auto mechanic shops, marinas, or other places where customers bring in their vehicle for service. While salary varies based on location and type of vehicles serviced, the average annual salary for a service attendant was $25,100. Motion picture projectionists set up and operate film projection and related sound equipment. They may also be responsible for inspecting the quality of films, and maintaining the quality of the film and sound equipment. Projectionists earn an average salary of $24,790. Laundry and dry-cleaning workers operate or tend washing and dry-cleaning machines. Workers may be employed at laundromats, dry-cleaning stores, or industrial washing sites that provide laundry services to larger institutions like hotels and hospitals. Laundry and dry-cleaning workers earn an average annual salary of $23,370. Parking lot attendants park and deliver vehicles to customers in parking lots or garages. They may also be responsible for patrolling the garage to prevent property damage and/or theft. Attendants earn an average annual salary of $24,330. Manicurists and pedicurists clean, shape, polish, and decorate customers' fingernails and/or toenails. They may work independently, or at a nail salon or spa. Based on salary and tips, manicurists and pedicurists earn an average salary of $24,980. Childcare workers are responsible for the well-being of children. They may be responsible for feeding and bathing children, overseeing play, and even help older children with schoolwork. Childcare workers may be employed at schools (as an afterschool or infant care worker), childcare centers, in their own homes, or at the homes of the children they care for. They may work full-time or part-time. The average full-time annual salary for a childcare worker is $23,760. Personal care aides assist the elderly, convalescents, or persons with disabilities with their daily living activities. These activities may include general housekeeping, preparing meals, and running errands. Aides may also assist patients with tasks such as exercising, eating, and bathing. Some aides also advise patients and their families regarding topics such as nutrition and household activities. Personal care aides may work in a care facility or at a person's home. While there are many similarities between a home health aide and a personal care aide, personal care aides typically provide less specified medical care. While a personal care aide may have home health aide certification, they typically do not hold any higher medical degrees or certifications, which a home health aide might. Personal care aides earn an average annual salary of $24,100. Pressers press or shape articles of fabric to remove wrinkles or patch items onto fabric. They may use a hand iron, or other steam or hydraulic machines. Pressers may also hang, fold, and package finished items for delivery. Pressers may work at laundromats, dry cleaning stores, or larger industrial facilities. Pressers earn an average salary of $23,080. Recreational protective services are responsible for monitoring recreational areas to provide protection and assistance to attendants. They may provide safety precaution information, monitor recreation areas, and be responsible for administering first aid to injured people. Recreational protective services workers may be stationed at pools or beaches as lifeguards, on ski slopes as ski patrollers, or in any other recreational area that requires protective services. Some of these positions require special certifications, such as first aid and CPR training. Recreational protective services earn an average annual salary of $23,570. Waiters and waitresses, also known as servers, take orders and serve food and beverages to patrons. They may work in restaurants, bars, hotels, or other food service establishments. Waiters and waitresses may work part-time or full-time. While a waiter's salary varies greatly based on the type of establishment, the average annual salary for a full-time waiter or waitress is $25,280. Cashiers receive and disburse money to customers purchasing goods and services. They typically work in retail stores. Cashiers may work part-time or full-time, but full-time cashiers earn an average annual salary of $22,130. Ushers, lobby attendants, and ticket takers work at various entertainment establishments, such as cinemas, concert halls, and theaters. They perform duties such as collecting admission tickets, helping patrons find their seats, and guiding patrons to facilities such as restrooms. The average annual salary for these positions is $22,580. Amusement and recreation attendants may work in a variety of recreation facilities, such as amusement parks, ski resorts, sports complexes, or community centers. They perform a variety of duties related to the use of the facility. They may operate amusement rides or concession stands, schedule use of the facility, and maintain and provide equipment to participants (particularly at recreation facilities). While salary varies depending on the type of facility, attendants earn an average annual salary of $22,760. Hosts and hostesses work at restaurants, lounges, and coffee shops. They are responsible for welcoming customers, seating them, and ensuring quality service. They may also be responsible for receiving and recording reservations and answering other calls. Hosts earn an average annual salary of $22,290. Dishwashers are responsible for cleaning dishes, utensils, and food preparation equipment. They may work at a variety of food service establishments, such as restaurants, coffee shops, and cafeterias. Dishwashers earn an average annual salary of $22,210. Fast food and counter workers are involved in a variety of food preparation and serving tasks in fast food restaurants, cafeterias, food concession stands, and coffee shops. The average annual salary for these positions is $21,380. 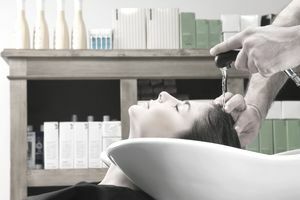 Shampooers massage, shampoo, condition, and rinse customers' hair before haircuts or stylings. Some shampooers also train to become hairstylists or cosmetologists. Shampooers earn an average annual salary of $21,650.